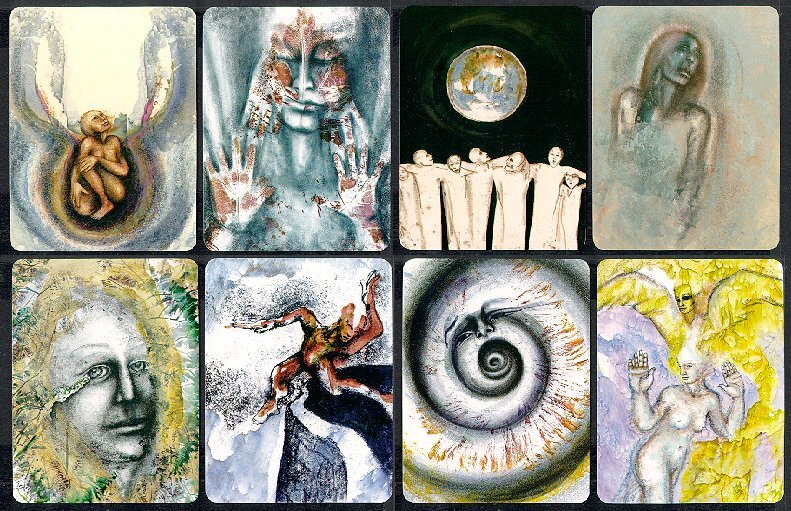 Today's Draw: From Soul Cards 2 by Deborah Koff-Chapin. What do you see in this card? Does it hold a message for you? And are you ready for a taste of something new at The Daily Draw? Soul Cards aren't tarot and they're not oracle cards. They're a thing unto themselves. It's just a deck of cards with art on them. There's no prescribed meaning to any of the cards. There's not even a name for each card. When I first set out to learn tarot, I memorized the 78 meanings of my favorite deck and thought I was pretty fancy. Every time I would choose a certain card, my inner librarian would retrieve the meaning and I'd regurgitate it to the sitter. And while there's nothing wrong with this—you can give an amazing reading just doing that—it started to bother me that MY readings were so mechanical. But by this time, I was ruined. I couldn't pull a Three of Swords without thinking "heartbreak". And by the time that came out, my opportunity for any intuitive hits off the card had passed. That's when I found Soul Cards. I read these instead of tarot for a couple of years to sort of reprogram all the brainwashing I had done by memorizing meanings. And the cool thing about Soul Cards is that you can't be wrong. Because there are no meanings to measure your reading against. You just got to go with what you get. What I get from this card is a signal that it's time to shake things up at the Daily Draw. :) I see a woman who has become so "at one" with this tree, that it's hard to see where she stops and the tree begins. In fact she's become such a part of the landscape that the skittish deer came within touching distance before he saw her. She is a part of nature and a part of the winter landscape. Her feet have turned to root. 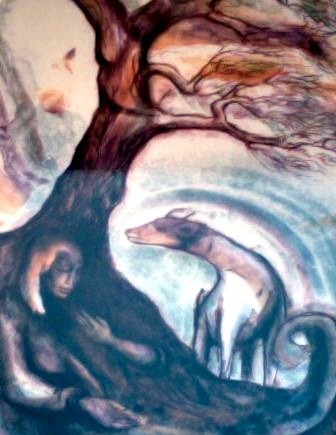 And she is so deep in her meditation or sleep that she's not giving off energy, while the deer is sending out ripples. She has gone so deep that she has embodied the slow, regenerative energy of a bare tree. So the deer didn't hear her, didn't sense her—didn't know she was there until he saw her. Or maybe she's part of his tribe and he came to find her and wake her up. A few years ago, I devoted two years to watching sunrises at my favorite park by the river. I went a minimum of once a week and sometimes went for sunsets, too. I was pretty much a regular there. I like to think, if asked by a passing otter or bluejay, the critters who lived there would say, "oh, her? She's cool. She won't bother you." While there, I would journal every morning, asking nature what it wanted to teach me. And, for me, listening meant "becoming part of the wind"...dissolving away my human nature and leaving just my "nature" to sense the scene. Sometimes I would find my lesson immediately. Sometimes I would have to sit a while before it came to me. It was never something I thought of in the car on the way over. It had to happen there. Spontaneously. It had to be the one teaching the earth prepared for me that day. Why I started doing it and why I stopped are like the stardust we were talking about yesterday. In a way, the journal entries were very much like these Daily Draw posts, but using nature as my oracle. Probably one of the biggest lessons I learned is that nature holds an abundance of spiritual secrets. It's like its own Sunday School and you can go every day and learn something different. A collection of Soul Card images. I always meant to do something with those journal posts...something that would make them into a book. But I never did. Until now. Recently a friend suggested that I devote one post a week to these messages from nature. Then, in a couple of month's time, I would have a few good ones to send off to a publisher. So that's what I'm going to do. For the next couple of months or so, we're going to do the Weekend Reading on Friday instead of Saturday. And the Saturday post will be devoted to what I consider "sermons from the church of nature". I truly believe there's a need out there for spiritual messages that aren't delivered from the pulpit. But I also believe my normal thing of using tarot gets in the way of the message for many who think tarot is either a) an abomination to God or b) woo woo or c) both. That said, what does today's card say to you? About keywords though, my card a day has cured that early problem. I've drawn every card 10-20 times and there is always something new to write, it's amazing. One thing that helps is I never look at them as predictive, only caring what that particular card says that particular morning. Best of luck with your project, I look forward to being an early reader of your published work. Thanks, Sharyn. I agree with you about seeing something different every time. I recently taught a group of new readers how to read cards without the book and they were amazing! I remember looking at the cards when I first started out and not being able to make sense of them, which is why I resorted to memorization. It's funny to look back on the journey like that, because I remember so clearly being clueless. And so I'm always amazed when these women in classes and meetups just pick them up and start going at it.